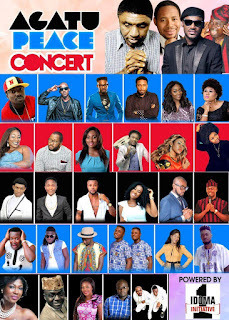 Frontline entertainers from the Idoma enclave would on Sunday, May 22 lead other celebrities in the country to Abuja for an epoch-making event tagged: Agatu Peace Concert. The event is aimed at drawing the attention of the relevant authorities as well as the international community to Agatu and other villages ravaged by Fulani Herdsmen. A statement issued on Saturday in Abuja by 1 Idoma Initiative, orgainisers of the event, noted that the peace concert would be used to raise funds to rehabilitate the Internally Displaced Persons across the communities. The statement signed by secretary general of the group, Barr. John Wayne said the event is slated for Sunday, May 22 , 2016 at the prestigious Sheraton Hotel, Abuja. Time: Red carpet 3pm. Main concert 4pm. According to him, "We want to use the concert to further draw the attention of the international community to the sufferings of our people back home in Agatu and other villages razed by Fulani Herdsmen. "After the protest which shook the nation, we felt there was a need for us to organise a concert to create further awareness. "Our people have been rendered homeless. Our crops have been destroyed by these cattle breeders. Our children are dying. Agatu is a ghost of itself. "The Peace Concert would be used to generate funds for the victims of Agatu crisis," he said. He added that leading the long list of entertainers to the concert is living legend and Idoma first son, Innocent Ujah Idibia, otherwise known as 2baba. 2baba will thrill the audience alongside his estranged bandmate and Agatu native, Austine Garuba Ahmedu, better known as Blackface, TerryG, Bongos Ikwue as well as Imelda J. Others are, gospel music crooners, Chris Morgan, Steve Crown, KingJames, MadMo, Noella, SixfootPlus, Naomee Da Diva, Oche.com, Favour Johnson, Tony Treasure and many more. Nollywoods supers stars such as Desmond Elliot, Uti Nwachukwu, Adah Ameh, Idoma duchess, Susan Peters and several others would also grace the event. Other invited guests include: Apostle of the Most High and Senior Pastor of Dunamis Int'l Gospel Centre, Dr. Paul Enenche; former Senate President, David Mark; Minister of Agriculture, Audu Ogbe and other prominent Idoma citizens. Enenche Enenche will along others anchor the event, which is proudly supported by: Idoma Initiative, Agatu Network Forum, Idoma National Forum, Brekete Family, Kiss FM, Lona Group, AIT, RayPower, Idoma Voice, Idoma TV, DayBreak Newspaper, I Am, Sound Factory, Vivid Soundz and others.